The Suomitar (meaning in Basque Finnish or from Finland) association has been working since 2000 in the Basque Country building bridges to bring the Basque and Finnish cultures closer together. Their activities include Finnish Basques as well as Basques that are enamored with Finland. The association is currently working on a Finnish-Euskara dictionary in which the cell phone giant, Nokia, has shown interest. One of its members, translator Joseba Ossa, emphasizes the connection between the two cultures, “Finnish is an old and small language, and so, Finnish people easily identify with the Basque culture.” An example of this is Tytti Thusberg, a Finnish designer who resides in Donostia, living and working in Euskera. Donostia-San Sebastian. Tytti Thusberg came to the Basque Country sixteen years ago, following a young Basque that she met in Finland. Today, he is now her husband and they have two children. Tytti designs purses with recycled materials in Donostia, following the slow fashion movement, and she speaks Basque well. “Of course my husband speaks Basque, and my children do too, so at home we speak Basque, read the paper in Basque…,” she explains. The road that took Joseba Ossa to Suomitar is similar but the other way around: “I went to Finland to learn Finnish for three years and I met a Finnish girl. We stayed there until I was completely integrated into the Finnish culture and then I said to her, ‘your turn’ and we came to the Basque Country. That was the deal,” he explained. They are still in the Basque Country and Mia has held up her end of the bargain: she has integrated and speaks Basque, like many other Finns in the association. Even though the two languages don’t have a direct relationship, Ossa assures that there is a great connection between Basques and Finns. “Their language is also very old and small, and that’s why they have a special link with us,” he explains. Tytti agrees, “The Finnish language and culture are very special and difficult. This creates a bond. In addition, the Finns have a very close relationship with nature, something that I've also found in Basque culture. " The principal objective of the association is to promote a relationship between Finns residing in the Basque Country and the Basques while sharing information. “Finnish journalists call us when they are talking about the Basque Country and looking for first hand information,” Ossa commented. 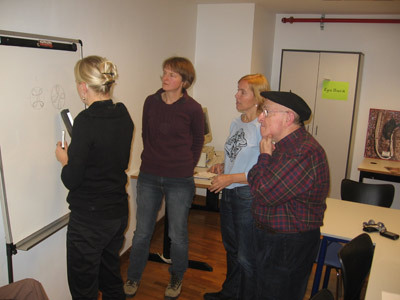 They are also connected to Basque activities in Finland, for example, through Hanna Lanto, Basque language and culture instructor at the University of Helsinki. Creating a bridge between cultures being the goal, the association has been working for some time on a Basque-Finnish dictionary. The project is progressing slowly but surely, with members volunteering during their spare time. The dictionary already includes 5,000 entries in both languages. “Part of it is posted on the internet, but we are currently updating our website. We hope to finish the dictionary by Christmas and then we’ll talk about publishing it,” says Ossa. That being said, they’ve already had an interesting offer: “Nokia, the Finnish cell phone giant, has proposed buying the dictionary. They want to include it in their cell phone apps,” Joseba explains. If you are a Basque speaker and live in the US, why not support your culture by teaching Basque?